The Battle of New Market was fought on May 15, 1864, in Virginia during the Valley Campaigns of 1864 in the American Civil War. A makeshift Confederate army of 4,100 men, which included cadets from the Virginia Military Institute (VMI), forced Union Major General Franz Sigel and his army out of the Shenandoah Valley. The cadets were integral to the Confederate victory at New Market. Source: https://en.wikipedia.org/wiki/Battle_of_New_Market. Photos courtesy of Ron Maness. Thank you for your response. 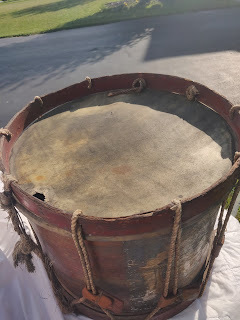 Attached are photos of the drum. Obviously, it is ID'd to VMI. The drum is small: 8.625" deep and 14" in diameter measured outside the rims. It appears unaltered. The lower edge of the drum is carved out at two opposing points to facilitate the snare. 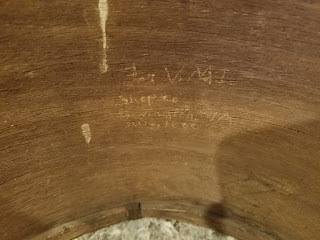 Written in pencil inside the drum (and difficult to photograph) is what appears to read "Y. Lilley Maker 1860". I'm not sure about the Lilley name. It's the best I can make out. The drum has come out of a very old collection and everything else in it is righteous. The drum and its markings appear good, but I am not a drum expert. With the drum are remnants of the rope and two leather tighteners (they are small and in poor shape). I will try, but I will forward the images to several others who may have more expertise in identification. In general, if there is any kind of evidence on the drum, such as pencil or ink inscriptions, the highest value could be in "as found" condition. If there are no historically relevant indications and the instrument is sound (or could be made sound) then restoration to playing condition could be warranted. 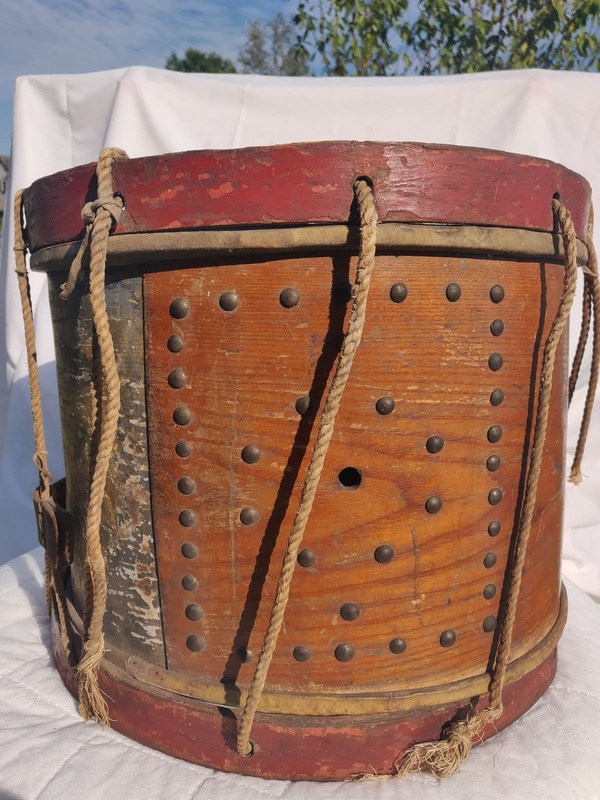 If I sent you photos of what presents itself as an 1860 production rope tensioned drum, could you help authenticate it? The item needs restoration, if it is a real drum. I suppose you might be interested in providing these services? A viewer recently wrote: Here's the latest project I just finished. 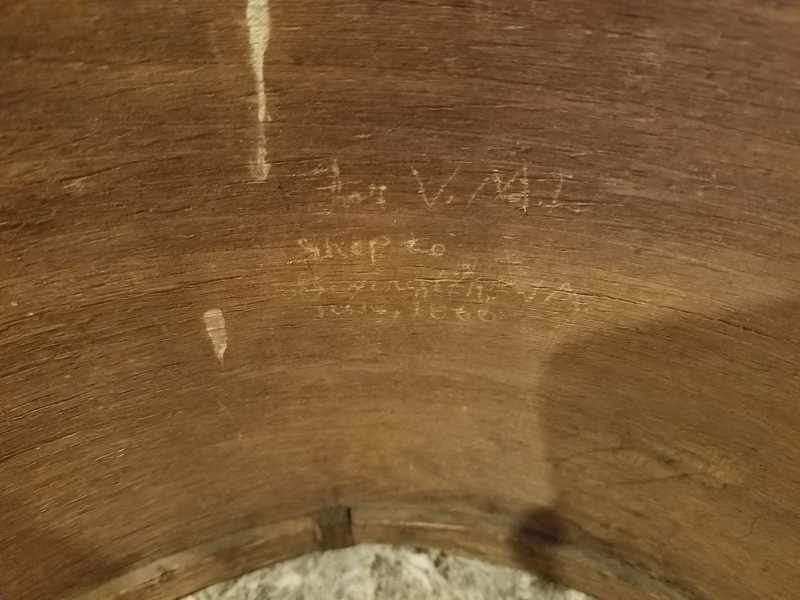 I wrapped my beat up WFL drum in ash veneer, which I had flat cut from a single log (not spliced together from multiple logs like most veneer), so it looks like it's a steambent solid shell with the overlapped seam. 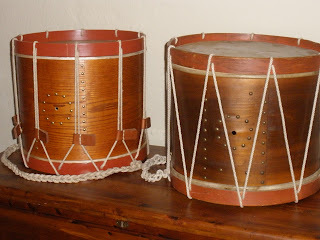 On the right is my 1862 Robert W. Warren drum. A friend wrote me recently saying that he was interested in the exact dimensions of the original leather ears on my mid-19th century drum pictured in "Drum by John Lowell of Bangor, Maine", this blog, March 5, 2008. Note that the original has a brass shield stapled to it. 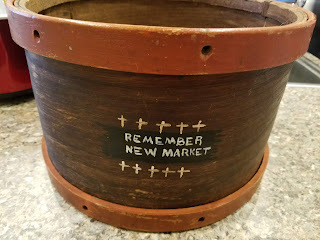 My refurbished John Lowell drum is discussed in the above-referenced blog post. "Your drum [Lyon & Healy bass drum, ca. 1890 with star inlay and inlaid circumferential stripes, design "Monarch"] appears to be in pretty good shape. If I were you I would just replace the heads unless there is significant splitting of the shell. Tucking skin heads is really not very difficult. I would practice on a snare drum before tackling a large bass drum, however. "You might also consider George Carroll. He could provide you with skin heads at a ... [low] price ... or do a complete restoration .... I am fortunate enough to live down the street from his shop in Alexandria [Virginia]. He has a small sample of his drum collection there. Many say that Mr. Carroll is the most knowledgeable person in the world on the subject of rope drums and historical rudimental drumming. His resume speaks for itself. He started the Old Guard Fife, Drum, and Bugle Corps. and also the Fifes and Drum Corp at Colonial Williamsburg in addition to transcribing all of the old drum manuals from the 18th and 19th centuries. "Incidentally George used to own the Excelsior drum company's catalog. It was either lost or stolen. "If you need any other advice, let me know. It was the morning of November 12, 1861, and at first glance the youthful federal soldiers of the 48th Pennsylvania Volunteer Infantry were not overjoyed by the unfamiliar sights and smells around them. They had landed at Hatteras Inlet, North Carolina which, compared to the lush green forests and farms of Eastern Pennsylvania, presented to them an endless and desolate expanse of bleached white sand. This was their first journey away from their homes in Schuylkill County, a region comprised of small coal mining towns near the Schuylkill River. One of those small towns, Palo Alto, lay on the south shore of the Schuylkill which flows eastward toward Philadelphia, less than one hundred miles away. And just fifty miles to the east was Bethlehem, settled in 1741 by a Christian sect of German Methodists called Moravians. The Germans brought with them a high regard for education and a love for music. "1 Just like those from Palo Alto, the young men from Bethlehem responded to the call for volunteers to put down the rebellion and don the federal blue. But unlike their comrades from Palo Alto, the Bethlehemians had not only relatives but also brethren in Bethania, North Carolina. Settled in 1759, also by Moravians, Bethania was a farm town not too far from Salem, North Carolina, the Southern home of the Moravians. Like their northern brethren, the Bethanians enlisted to serve, not to put down the rebellion, but to don the confederate gray and support it. These blue clad and gray clad Moravians had more than their patriotism in common; they shared a talent for music and their Christian heritage, complete with its signs and symbols. "In their boarding schools they learned to draw their great Moravian symbol, the Star of Bethlehem. In this fashion, by drawing the shapes of a pyramid and gluing the shapes together they created a multi-pointed star. 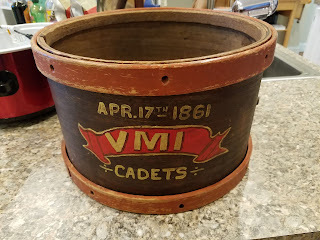 "2 As the clouds of war darkened, many of the Moravians, both men and boys, would join their respective ranks, not as soldiers, but as musicians. 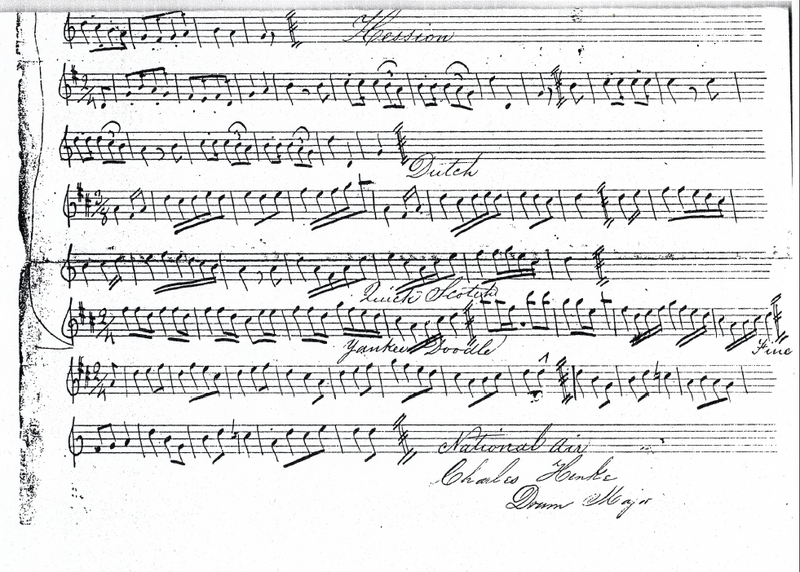 Following the first cannon blasts at Fort Sumter, Moravian musicians from Salem, also known as the Wachovia Region, or Piedmont, formed three bands, initially named as militia units. "The Forsyth Grays" became Company E of the Eleventh Regiment, North Carolina Volunteers. This Company changed later to the Twenty-first Regiment, North Carolina Troops. Forming soon after was the Bethania Brass Band, also known as the "Confederate Stars" which became Company F and later Company I of the Thirty-third Regiment, North Carolina Troops. Finally, there was the Salem Brass Band, which would famously become known as the 26th North Carolina Regimental Band. "3 They would all wear the gray. At Hatteras Inlet the young soldiers in blue eventually began to frolic in the surf, gathering what they called "secesh" shells. They'd ship the secesh shells home to their relatives in wooden crates onboard ocean-borne "steamers. "4 For now they had every reason to enjoy themselves because the sobering slaughter at Shiloh and Antietam was still on the horizon, and General Ambrose Burnside's star was on the rise. They didn't know what lay ahead, that three years hence their skills and ingenuity would be called upon to attempt a bold and decisive end to the war, a nightmarish, seemingly endless war. They would tunnel underneath the rebel lines at the last citadel of the Confederacy, Petersburg, and plant a ton of explosives creating what would be known ever after as "The Crater" and the demise of General Ambrose Burnside's career. But outside of making history, during the course of their war, the soldiers of the 48th Pennsylvania would capture two eagles - two American Bald Eagles - making them souvenirs and shipping them back home to Schuylkill County. "A live eagle was captured after putting up a fight on the 48th's picket line at Hatteras Inlet. 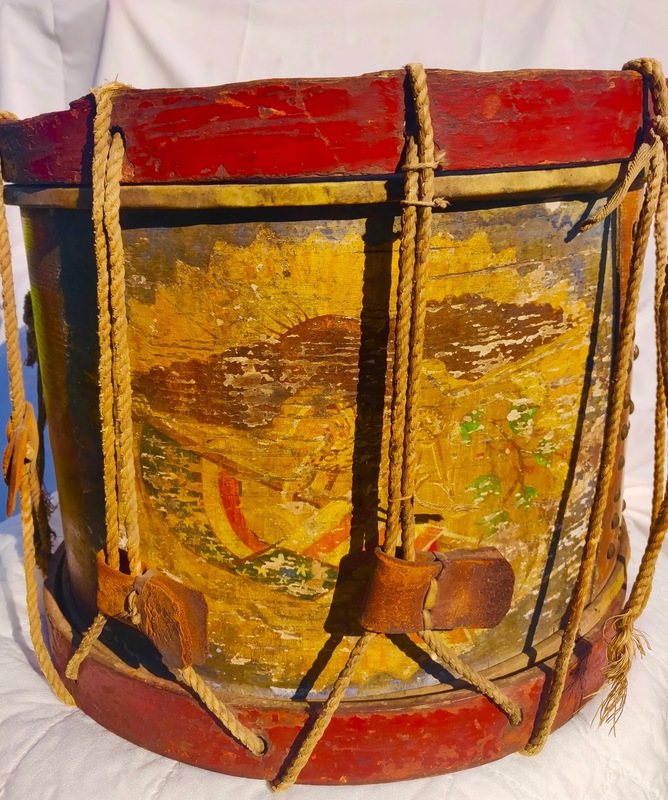 "5 The other eagle, a defiant eagle, hand painted by an unknown artist on the face of a rebel snare drum was captured on a battlefield late in the war. 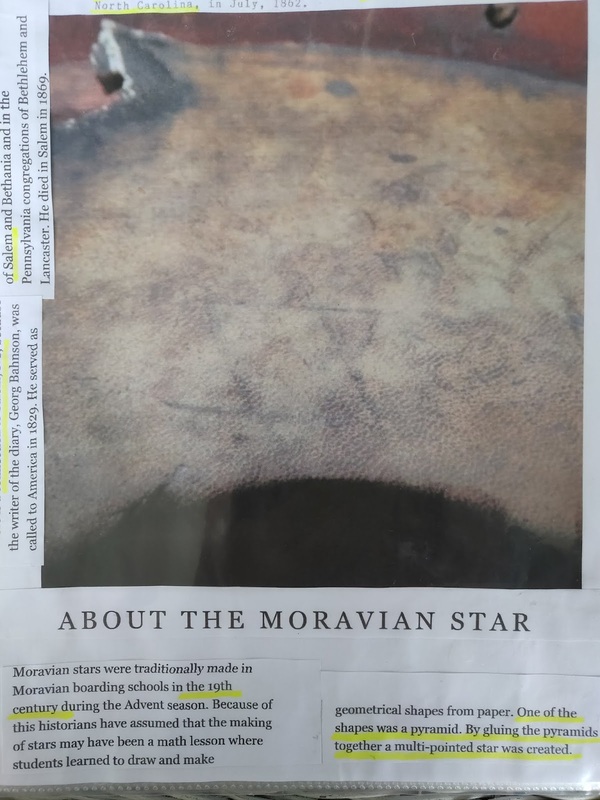 Drum Head clearly marked "LANE BAND"
The bottom drum head of the rebel eagle drum bears a number of six pointed stars, one of them large, "shaped in the same fashion as drawn by Moravian boarding school students in the mid-19th Century at Old Salem North Carolina.6 Printed below the larger star by the same hand are two words "LANE BAND." Appearing to the side of those markings in bold period ink is the name and home town of the soldier of the 48th Pennsylvania Volunteer Infantry who "captured" the drum to send home to Schuylkill County - (George W.) "Stellwagon, Palo Alto, Penna". The snare drum’s dimensions are 12-1/2" tall and 14-1/2" in diameter. The shell is uncut. Next to the spread-winged eagle motif is a symmetrical tack pattern that consists of a circle around the vent hole encompassed by a large square. The hoops, heads, leather tugs and rope tensioners are original. The free-hand painted motif consists of a spread-winged bald eagle on a gold sun-rayed blue field. The bald eagle is grasping a broken flagstaff of a furled federal flag in its beak. The eagle, with the broken flagstaff in its beak is portrayed on the ground with pointed green ivy leaves and red berries. In its talons is a clutch of arrows. George Stellwagon, an infantryman of the 48th Pennsylvania, as far as we know, was with his regiment at the battles of Roanoke Island, New Berne, Second Bull Run, Chantilly, South Mountain and Antietam, where he sustained a serious head wound while waiting in line to cross Burnside's Bridge. Stellwagon recovered to re-join the 48th in 1864 for the Battle of the Wilderness onward. What is the meaning of the words "LANE BAND"? The words printed by the hand of the Johnny Reb musician himself represent the Confederate regiment and brigade to which the rebel eagle drum belonged: the Thirty-third Regiment, North Carolina Troops of General James Henry Lane's Brigade. General Lane received his brigadier star in November 1862 following the death of General Lawrence O. Branch at Antietam\Sharpsburg. And how do we know this? 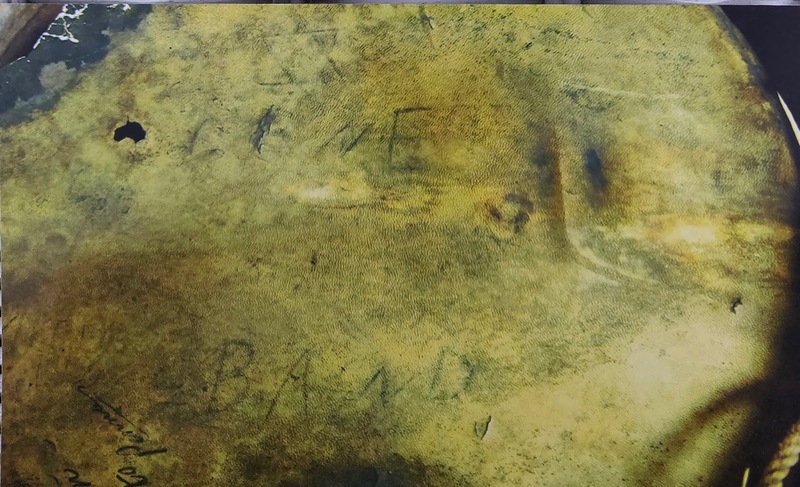 The Reminiscences of Oliver J. Lehman reveal the story.8 Known as O. J., Lehman was a Moravian musician from Bethania, North Carolina who enlisted in Lane's Brigade and became band master to the Thirty-third North Carolina Regimental Band. Lehman chose to serve with his fellow musicians who were formerly members of the Bethania Brass Band the "Confederate Stars." 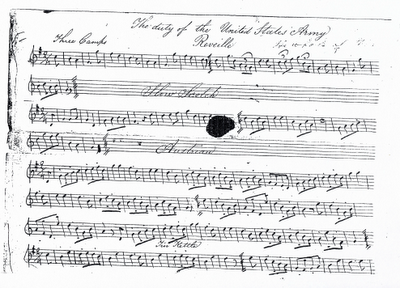 "The Thirty-third Regimental Band, although assigned to regimental status, was actually the brigade band for General Lane's Brigade, which included the Seventh, Eighteenth, Twenty-eighth, Thirty-third, and Thirty-seventh North Carolina regiments. "9 The Brigade was attached to Pender's Division, Third Army Corps, Army of Northern Virginia. While the live bald eagle at Hatteras Inlet put up a ferocious fight before succumbing to capture by a lieutenant and two privates of the 48th Pennsylvania armed with a fusillade of sea shells, the eagle on the rebel drum of General Lane's Band witnessed a much more prolonged and bloody struggle. We can only speculate that the rebel drum eagle heard the screams of wounded soldiers about to be consumed by flames in the woods at the Battle of Chancellorsville and witnessed the aftermath of the accidental death of General Stonewall Jackson caused by friendly fire from a sister regiment in General Lane's Brigade. We can only speculate how close it got to the brave faces of General Lane's infantryman as they formed the battle line on Seminary Ridge before marching toward those horrible cannon on Cemetery Ridge at Gettysburg. 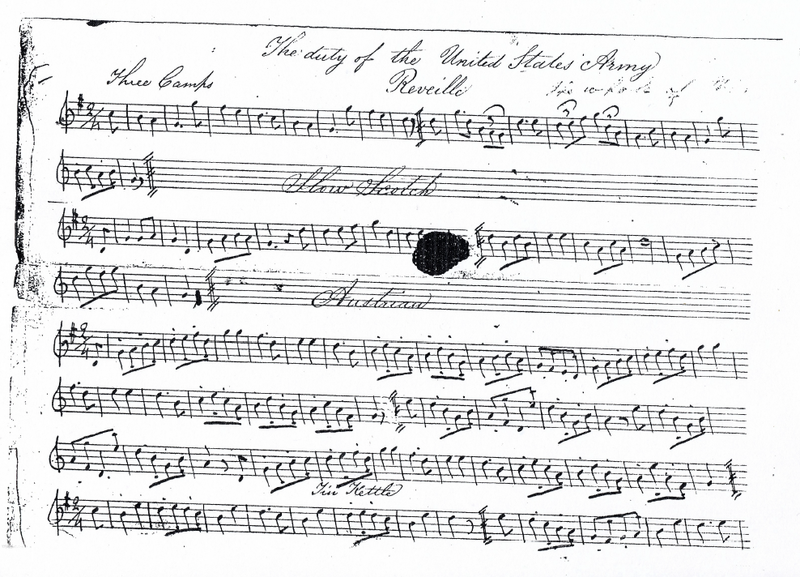 Did it inspire those brave soldiers by playing their favorite tunes Bonnie Blue Flag and Dixie? 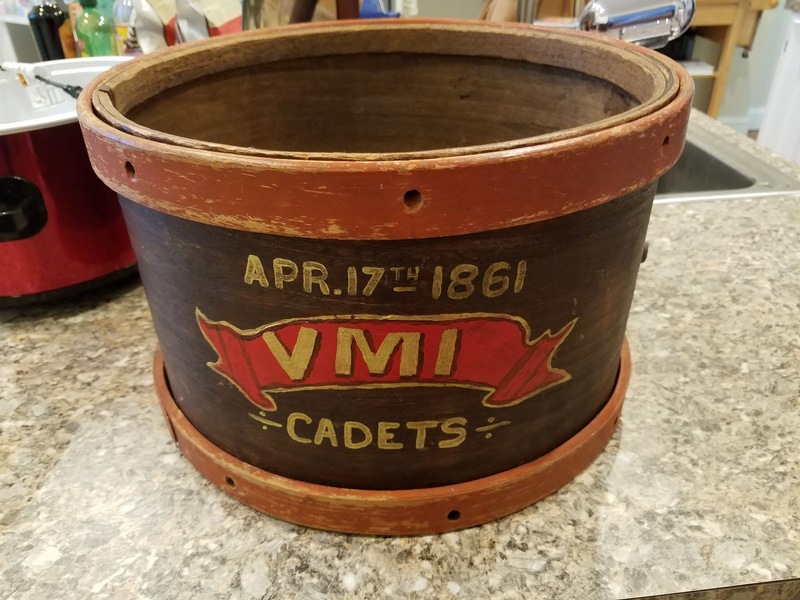 We can feel confident that the rebel drum was there when fate brought together the 48th Pennsylvania Volunteer Infantry and the Thirty-third North Carolina Regiment. We can surmise the day of the eagle’s capture in the bloody muck at Spotsylvania or near the last desperate ditches of the federal Sixth Corps' breakthrough at Petersburg. But the eagle emblazoned on the rebel drum, although forced to surrender, has never surrendered its indomitable mystique. For when all is quiet, with an imaginative ear pressed against the vent hole, one can hear off in the distance, feint but unmistakable, spine tingling, the echo of the Rebel Yell. I would like to recognize two persons in particular who helped me with their knowledge, expertise and literary resources on the topic of Moravian Civil War history in Salem, North Carolina, namely, Historian Philip Dunigan and Office Manager Sarah Durham. And to express my appreciation and gratitude for the invaluable forensic and technical skills of my friend, Ed Carlini. And to my sister Anne Marie "Bunchy" Schwelm, for her moral and literary support and assistance, and for the many years of sharing the joy of Our Great American History. 1 Hall, Harry H. 2006. 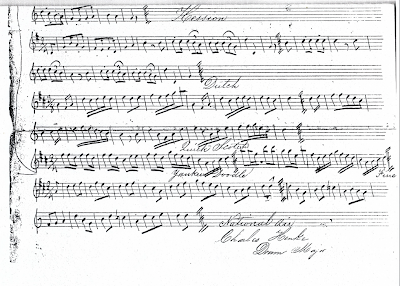 A Johnny Reb Band from Salem: The Pride of Tarheelia. Raleigh N.C.: Office of Archives and History, N.C. Dept. of Cultural Resources. 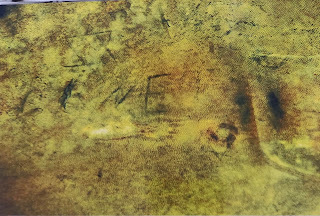 8 Lehman, O. J. Reminiscences of the War Between the States, unpublished manuscript. Raleigh, N.C.: North Carolina State Archives. 9 Ferguson, Benny Pryor. 1987. The Bands of the Confederacy: An Examination of the Musical and Military Contributions of the Bands and Musicians of the Confederate States of America. North Texas State University. 10 Lehman, O. J. Reminiscences of the War Between the States, unpublished manuscript. Raleigh, N.C.: North Carolina State Archives.